In some other post I have written how you can deploy a Nano Server on premise using PowerShell or the Nano Server Image Builder. In this post I will quickly show you how you can setup a new Nano Server in Microsoft Azure. To deploy Nano Server in Azure, Microsoft offers you a Nano Server Image in the Marketplace. There are also several ways you can deploy Nano Server, for example using the Azure Portal or PowerShell. 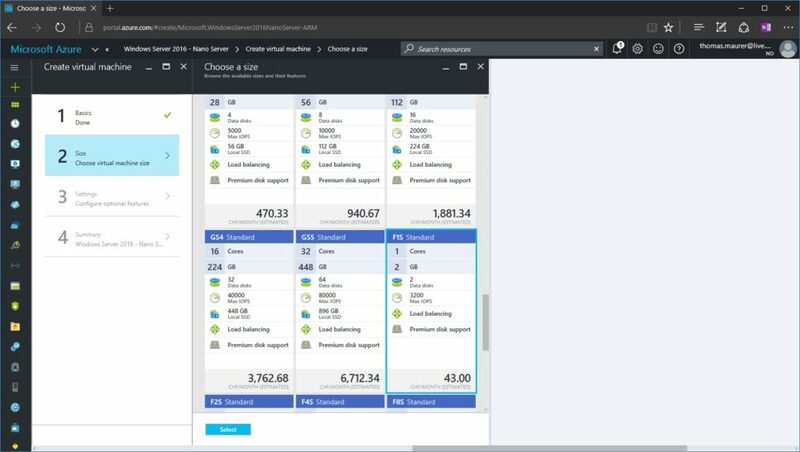 First this will show you how you can create a Nano Server Virtual Machine using the Azure Portal. Simply follow the steps to create a new Azure Virtual Machine. The most important part is to configure the Network Security Groups to allow PowerShell Remoting since Nano Server does not support RDP. There are two options to do this, using WinRM over http (5985) or using WinRM using https (5986). To be honest in production you should only use https, but for some demos or if you are configuring Nano Server to be used over a VPN you can also use WinRM over http. I also recommend that you remove the RDP port rule, since this is not really necessary. If the WinRM rule in the network security group is not already there, just create it. For easy setup you can use 5985 if you want to use SSL you will require additional steps. Follow the rest of the wizard to deploy the new Nano Server VM. After the VM is created you will see it in the Azure Portal. 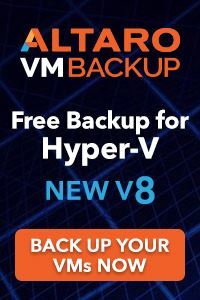 You can now use the IP address to connect to the virtual machine using PowerShell remoting. 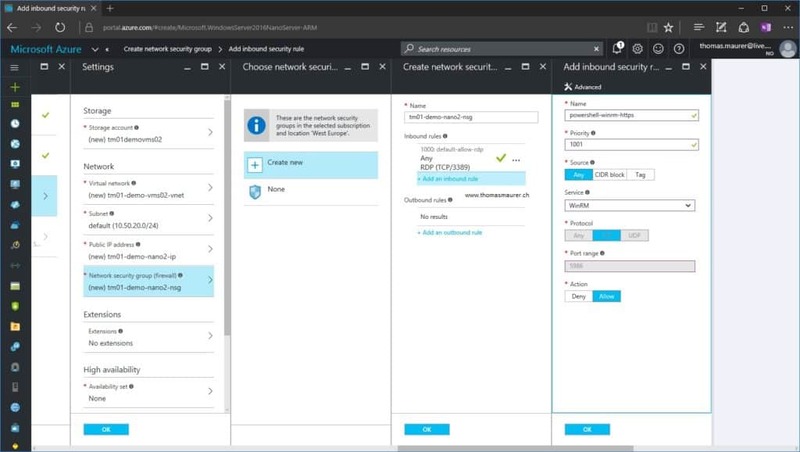 If you don’t have a VPN connection to the Azure VM Network you will need to use the public IP address, if it is connected trough a VPN or from another machine running in the same VM Network, you can use the internal IP address. In my demo case I am using the public IP address to connect to the virtual machine. To make it easier I also created a Public DNS name for this Azure IP address. 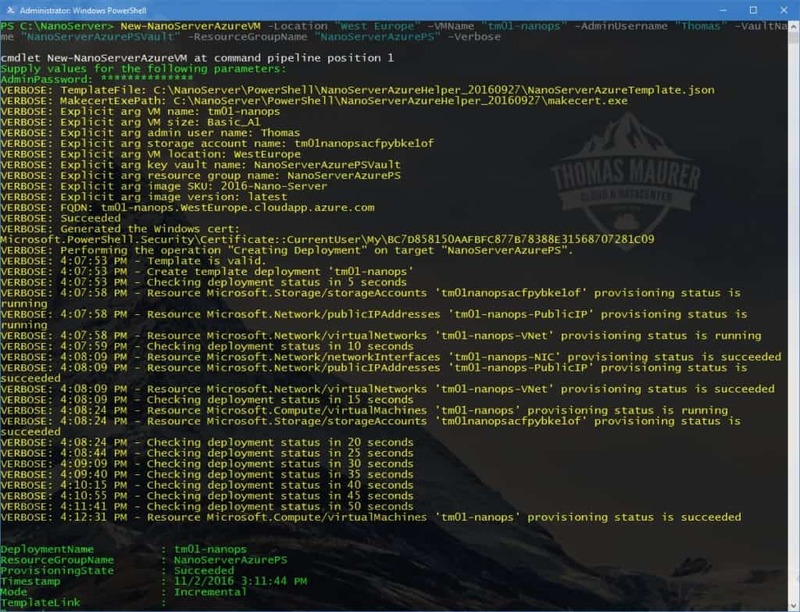 To connect to your Nano Server you also have to setup PowerShell Remoting on your machine and add the host to your trusted hosts group. You can now connect to your Nano Server running in Azure. First you have to install the Azure PowerShell Module and get the NanoServerAzureHelper PowerShell Module (NanoServerAzureHelper_20160927) this will help you with the setup. First create a new Azure Resource Group and a Key Vault if you don’t have them already available. The key vault will be helping you to use SSL configuration for your PowerShell remoting. 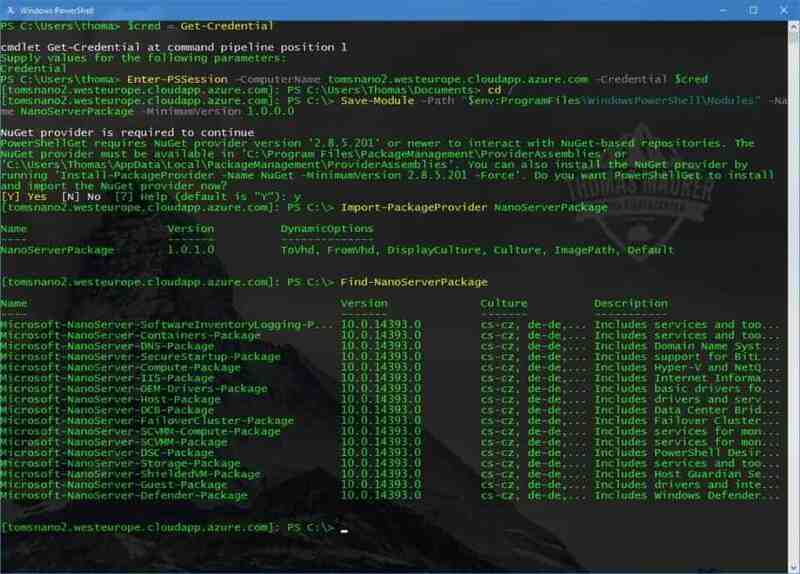 New-AzureRmResourceGroup -Name “NanoServerAzurePS” -Location "West Europe"
Import the NanoServerAzureHelper PowerShell module which you have downloaded before. This will give you some new PowerShell cmdlets to deploy Nano Server quickly on Azure. 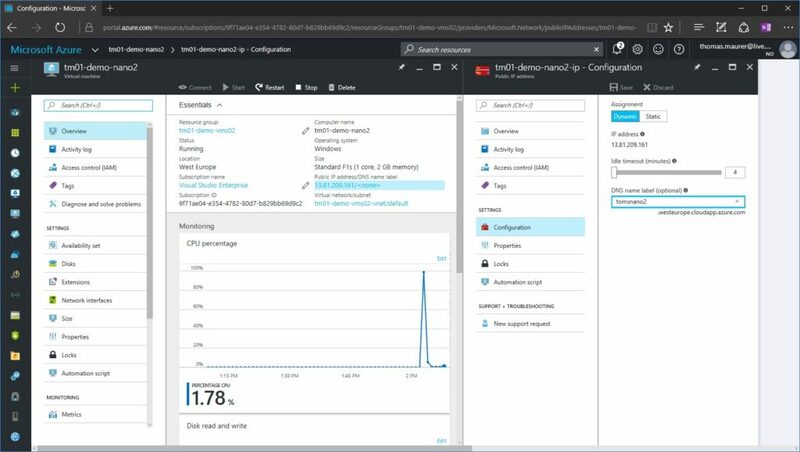 The most important for creating new Nano Server VMs in Azure is simply the New-NanoServerAzureVM. 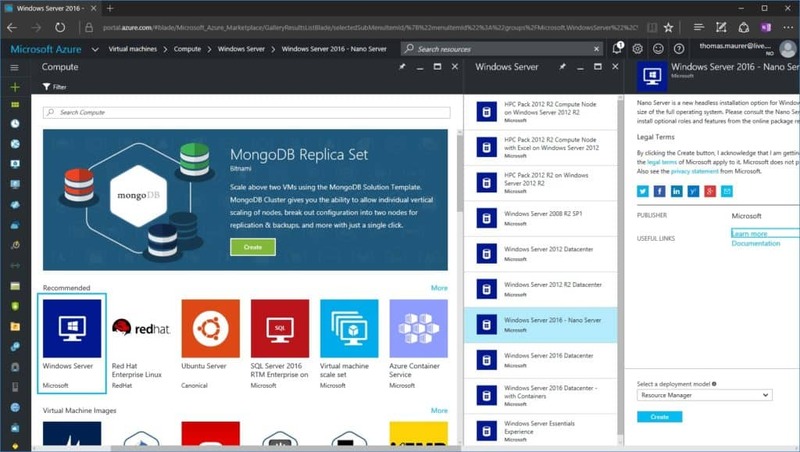 Get-AzureRmPublicIpAddress -ResourceGroupName "NanoServerAzurePS" Enter-PSSession -ConnectionUri "https://tm01-nanops.westeurope.cloudapp.azure.com:5986/WSMAN" -Credential "~\ThomasMaurer"
Enter-PSSession -ConnectionUri "https://tm01-nanops.westeurope.cloudapp.azure.com:5986/WSMAN" -Credential "~\ThomasMaurer"
Since in Nano Server does not include any roles per default you can now use PowerShell Package Management to installed Nano Server Packages on your Azure Virtual Machine. Thanks for the info. 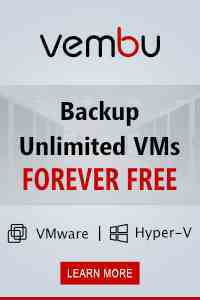 Quick question – how would I get access to the EMS on a Nano instance hosted in Azure? I know the EMS has a console option for resetting WinRM (for instance) but with no console access in Azure how can I reset that if needed? 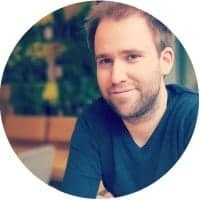 I came across this article while searching how to deploy Nano Server on Azure. I know it’s an old one but I cannot find a more targeted article. I try to deploy Nano Server on my MPN Azure subscription but I get an error. The same error appears both on portal and on PowerShell. It seems that the image is missing. Indeed, when I run the following cmdlet I get an empty result, which is an indication that although the image is advertised, it is not actually available. I opened a ticket on Azure and I got the reply that Nano Server is in preview. Is it true? How can it be in preview since 2016?? Am I missing something? Hi Microsoft stopped supporting Nano Server as a full operating system and only supports it as a Container Image. 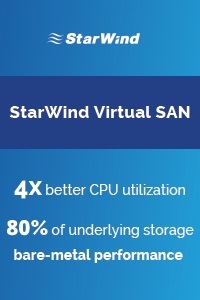 This means you should only deploy Windows Server Core or Windows Server with Desktop Experience.